(Bulky items obviously incur different rates). 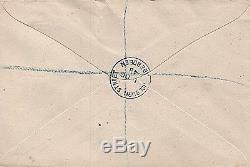 In any multiple listing the stamp depicted may not be the exact one you receive. We will always send the best available quality. Please note: If checkout is not completed within 7 days we will assume you are no longer interested and item/s will be relisted unless prior arrangements have been made. We endeavour to describe all items honestly and correctly. If sending a cheque or Postal Order please make payable to: Tagula blue Ltd. The item "KGVI sg478c £1 brown Aberdeen Registered First Day Cover Fine" is in sale since Monday, April 30, 2018. 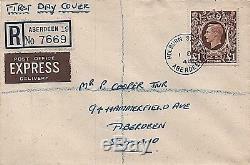 This item is in the category "Stamps\Great Britain\First Day Covers\Pre-1952". The seller is "tagula_blue" and is located in Horsham, West Sussex.